Asus has a treat in store for PC owners after it detailed a high-end toughened motherboard that is the first to support all NVM Express storage devices. 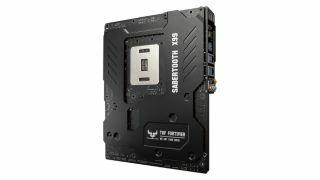 The TUF Sabertooth X99 also offers support for PCI Express, M.2 PCI Express and the latest 2.5-inch solid state drives with SFF-8639 using its on-board SAS HD connector on the Hyper Kit expansion card. It also has not one but two USB 3.1 ports that provide an uplift in data transfer speed to a zippy 10Gbps and will be ideal for the most power-hungry of users. This is in addition to four USB 3.0 ports, four USB 2.0 ports, a plethora of other ports, and space for Thunderbolt at a later date. Users can pull up detailed information on the board at any time using the TUF Detective app on any smartphone or tablet, and it is the first board to offer this feature. Asus keeps things cool through Thermal Armor technology and the accompanying Thermal Radar 2 software allows users to control 11 fan connectors. If that wasn't enough it also has a built-in TUF ICe microchip that can provide extremely precise temperature monitoring and fan control. As the name might suggest, Asus's TUF range is designed with durability in mind and to this end the Sabertooth X99 has TUF ESD Guards 2 that are twice as strong as the previous incarnation and can protect against sudden electrostatic discharge. All motherboards under the TUF banner are also certified for military use and and have a five-year warranty. The Asus TUF Sabertooth X99 doesn't have a release date but will cost $350 (around £236, or $457) when it hits the shelves.